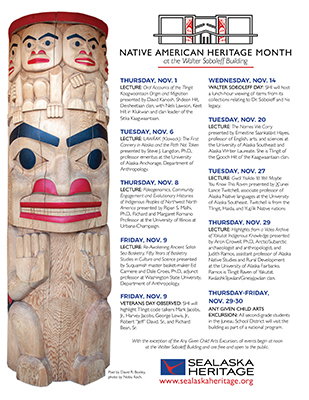 Sealaska Heritage Institute (SHI) this week will sponsor a lecture on the Indigenous knowledge of the people of Yakutat, in recognition of Native American Heritage Month. In their lecture, Highlights from a Video Archive of Yakutat Indigenous Knowledge, Judy Ramos, assistant professor of Alaska Native Studies at the University of Alaska Fairbanks and Aron Crowell, an archaeologist and anthropologist with the Arctic Studies Center in Anchorage, will discuss the Yakutat Seal Camps Project, which ran from 2011-2014 and combined oral tradition and archaeology to explore 1,000 years of community history. Ramos, who is Tlingit Raven from Yakutat, and Crowell will show highlights from videos made during the project that documented Yakutat stories and Indigenous knowledge. The lecture is scheduled at noon on Thursday, Nov. 29, in the Living History Room at the Walter Soboleff Building in Juneau. The event is free and open to the public. Everyone is welcome. Judy Ramos is from the Kwáashk’ikwáan/Gineixkwáan clan in Yakutat. Her Tlingit name is Daxootsu. Ramos’s Ph.D. project is part of an Arctic Studies Center Smithsonian National Museum of Natural History research project documenting the 900-year history of Alaska Natives’ relationship to the Hubbard Glacier and seal hunting in Yakutat Bay. She is a member of the Mt. St. Elias Dancers and enjoys beading and working on subsistence food from her village. Dr. Aron L. Crowell is an Arctic/Subarctic archaeologist and anthropologist whose research and publications have focused primarily on the peoples of the Gulf of Alaska region, where he is currently leading an NSF-funded study of the human and environmental history of Yakutat Bay in partnership with the Yakutat Tlingit Tribe. Crowell is the Alaska director of the Smithsonian Institution’s Arctic Studies Center in Anchorage and curator of the Center’s collaborative exhibition Living Our Cultures, Sharing Our Heritage: The First Peoples of Alaska.